Kolkata Port is India's only riverine port with two dock systems - Kolkata Dock System at Kolkata with the oil wharves at Baj Baj and a deep water dock system at Haldia Dock Complex, Haldia for sea borne trade. 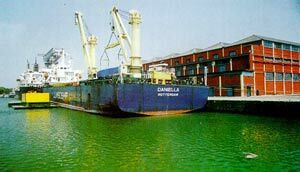 It has the most sophisticated port facilities with extensive storage facility for diverse cargo. With a modern computerised container terminal, Kolkata port offers a very customer friendly approach.